As in so many professions, the evolution of technology continues to add new dynamics to the practice of oral history. Indeed, longtime veterans of the field have witnessed this development firsthand, as audio recorders transformed from the reel-to-reel setups which nearly required an entire tabletop, to digital devices that now can neatly fit in the palm of one’s hand. And with these changes came new dynamics in the interview process. Bulky equipment no longer encumbered the space between interviewer and narrator, nor did concerns about power sources, room size, or running out of tape. 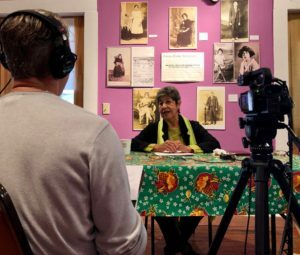 Today, video recording has become standard practice for many in the field of oral history—a technological step that The Oral History Center took almost two decades ago. In some respects, the use of video could be seen as taking a step backwards, reintroducing a few of the same burdens in the interview process that developments in audio had solved. 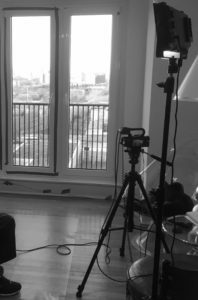 Yet on the other hand, video also opened up new realms of opportunity, enabling one to capture and preserve an interview in its totality and place both an audio and visual recording of the conversation into the historical record. And of course, among the many promising uses of such video recordings is a documentary film. Conducting interviews that will be used in a documentary, however, again ushers new dynamics into the interview process, dynamics I began to experience firsthand. In 2016, I initiated the Chicana/o Studies Oral History Project which sought to document the experience of the first generation of scholars who founded and shaped the academic discipline over the last half century. This past year, we decided to partner with film makers to put those twenty-five interviews into conversation in a documentary, tentatively titled Chicana/o Studies: The Legacy of a Movement and the Forging of a Discipline. Since joining the OHC, I had video recorded scores of interviews, and thus was no stranger to the practice of framing a pretty good shot. I paid attention to lighting, the triangulation of the camera with myself and narrator, and made sure to avoid the cardinal sin of having something in the background seem like it was sprouting out of the narrator’s head. Yet when the prospect of using these recordings in a film became a reality, I quickly realized that I had a responsibility to take much more time and care in the videography. A “pretty decent shot” was no longer good enough to do justice to both the film and the narrators featured in it. I thus began to more closely select the interview space, one that featured the best possible light and, above all, background. In the past I feared inconveniencing my narrators, often settling for a less optimal video shot because it was easier for them. Yet for the film, I now had to become assertive about the recording space. It was no longer out of the ordinary for me to rearrange a corner of someone’s office or living room, and spend 20 minutes or more staging the background using items from around the room, office, or house. In fact, at times I even brought my own staging materials when needed. At first blush, such procedures could be deemed more hassle than benefit—a sentiment I’m sure a fair share narrators likely held. Yet my answer to looks of “is this really necessary” was to reassure them of my simple aim: This is for a film, and I want you to look your very best. When thinking of best practices for videography, I believe that simple aim stands at the center: To place the narrator in the very best position to represent themselves. Achieving that goal surely takes more time and care than just simply sitting down and pushing record. It requires being assertive about the recording space, taking the time to properly stage that space, and paying attention to the little details that, more times than not, we would all prefer to sidestep. Yet when done correctly, you will have a finished product that does justice to both the overall project and, most importantly, the narrators featured in it. I’ll come back to this scene in a moment, but first I want to address the context that produced it. Here at the Oral History Center, we engage in a classic oral history best practice: an unrecorded, preliminary interview prior to an actual recording session. The reasons for doing so are fairly common-sense: to build a relationship of trust with the narrator, to review the narrator’s rights and the interviewer’s responsibilities, and to cover any technical aspects of the recording, such as signaling to mind the microphone or even to take a bathroom break. Beyond this list of basics, however, there is a whole world of communication between narrator and interviewer that surrounds the words that are ultimately recorded for posterity. In my experience, narrators want to know who the interviewer is. It’s only fair. I’m asking them to narrate details about their personal and professional lives. Who is this person who is asking them all of these personal, probing questions? There is an imbalance there that can be mitigated if interviewers at least show they are willing to share details about themselves. Oral historians are not therapists; there is no professional obligation not to share one’s own views, although there is a certain formality and distance that is appropriate during the performance of the interview. Outside of the interview context, however, we are perhaps more like producers or recording engineers for musicians. We are there to get the highest-resolution document of who narrators think they have been throughout their lives, what they have witnessed, and what they believe. To do that well, the interviewer needs to have a clear understanding of the context in which narrators have lived their lives, to imagine future audiences for what the narrators have to say, and to understand what the narrator wants to convey, and how they best hope to do so. For their part, narrators often want to know something, maybe a fair bit, about their interviewers: their backgrounds, their understanding of the history to be explored, and their goals for the project they are engaged in together. But there is a deeper level of engagement with the narrator outside of the interview context, “offstage” as it were, that can sometimes lead to these revelatory moments on camera. If you can make it happen, there are few substitutes for breaking bread together. Even a snack on a break between sessions is an opportunity to share something about yourself, and it gives them a rest from talking on record, which is often quite tiring for most people. I always learn in these moments more about their passions or pastimes that might not be planned as part of the interview. In one instance, a conversation about food over lunch ended up as the seed for an important discussion on camera about the relationship between diet, social policy, and governance. The more you know about the person you are interviewing, the more successful you’ll be in shaping the direction of the recorded discussion and the more rewardingly candid the conversations are likely to be. Careful planning of interviews is always important, but casual conversations can lead to fruitful and spontaneous explorations when it comes time to record. To this day, it’s not exactly clear to me what led the narrator who I mentioned earlier to disclose this story with such candor. The story concerned a university-based scientist whose external support was withdrawn when the sponsor did not like the results of the research. We talked at length about the themes of the oral history project, and about the political dimensions of some of the work he was doing. But we also spent a lot of time talking about music, family, and personal challenges. I had not planned to go in the direction he suggested. In fact, the existing historical literature on the subject suggested that the story I expected would be very different form the one he ended up telling. It was a privilege to hear such important historical detail, which served to complicate our conventional understanding of a subject, and it had everything to do with the mutual trust between the narrator and the interviewer. It’s important to stress that this talk offstage is not a calculation on my part. I don’t set out to cultivate a relationship with a narrator in order to get fuller disclosures than they would otherwise make. I owe it to my narrators to keep a formal tone in the interviews, to signal continually that, yes, they are being recorded. Professionally, your eyes should always be on helping narrators tell the richest stories they can about themselves and the world in which they’ve lived. The conversations offstage help narrators get comfortable with recorded communication beyond their own expectations of what they think an audience, however they define it, might want to hear. Of course, there isn’t always the luxury of time to build such a relationship with a narrator. But it is possible to develop rapport and learn helpful information in as little as five minutes. In fact, it’s in those constrained moments when I get peppered with the most rapid-fire personal questions. “We don’t have much time here, so who the heck are you?” By keeping in mind the boundaries the narrators have set for what they wish to discuss. And, by being open, vulnerable, and genuine, I can be a better partner in the process. It’s this trust that allows narrators to tell fuller stories when the red light is on and the recording device is rolling.